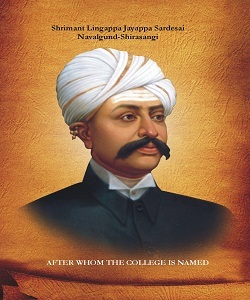 The Karnatak Lingayat Education Society was established in 1916 with the objective of spreading education among the farming community and other educationally disadvantaged people in this part of Karnataka. The establishment of Lingaraj College in 1933 was the beginning of the fulfillment of this vision. Over 85 years of its existence, the Lingaraj College has built up a strong image as an institution, with firm belief in and commitment to, the dissemination of quality and value based education in humanities, commerce and business administration. Adhering to its set goals and objectives, the college went through the process of self assessment and accreditation as required by NAAC an autonomous institution of the University Grants Commission, New Delhi. The college is conferred with Autonomous Status on 27-01-2005 by UGC. The College introduced new programmes in; Business Administration during 1996-97, P.G. Course M.A. in English in 2004-05, P.G. Course in Economics in 2010-11 and P.G. Course in Commerce in 2013-14 under self financed scheme. Our P.G. students of English have bagged 14 Gold Medals consecutively for three years from 2005-2007 when affiliated to Karnatak University, Dharwad. The NAAC re-accredited the college at the 'A' level in September, 2010 with 3.15 CGPA. The college has become Autonomous from the year 2007-08. The UGC has recognized the College as the College with Potential for Excellence in the year 2010. The second phase of the College with Potential for Excellence is given to the College in the year 2014. We welcome you to be a part of this rich educational heritage of the Lingaraj College.